The Monadnock Conservancy in Keene got $1.2 million on December 21 from the federal government to save farmland in New Hampshire near Keene and Brattleboro, especially farms along the Ashuelot, Connecticut and Contoocook rivers. The money must be spent by 2021. The Conservancy said it would save at least 1,000 acres with the money, and another 1,700 or more acres with state money and private donations. In Amherst, the Kestrel Trust “conserved or secured funding to protect more than 1,000 acres across the Valley” this year, according to a December 23 e-mail from the group's director, Kristin DeBoer. 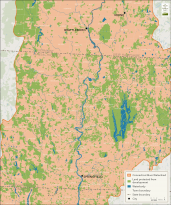 The group saved 52 acres in Pelham, Massachusetts, which borders Amherst, and a 128 acre piece of land that is in the Massachusetts towns of Williamsburg and Hatfield, both of which border Northampton.